Never before have I recognized the need to find money-saving grocery methods as I do now. My boys have always been big eaters. But now that 2-almost-3-out of 4 of them are teenagers? There is no sentence to follow that question. It’s just. The food. They eat. I’m so. Wow. “So, would this food last you for about a year do you think?” Oh dear, no (said I, with a giggle). What you see here will be gone in three months. Well anyway, money saving tips on food are necessary – for all of us, wouldn’t you agree? Each Monday for the next few weeks, I plan to share a way to save money while eating healthy food. Healthy food is so important so that we can all thrive physically and emotionally! These posts won’t be about skimping on nutrition, but rather attaining nutrition without breaking the bank. Of course, I’ll continue to share all the great online deals I find at anytime throughout the week. But I continue learning new tricks to keep my healthy food grocery budget reasonable. I can’t wait to share! 1. 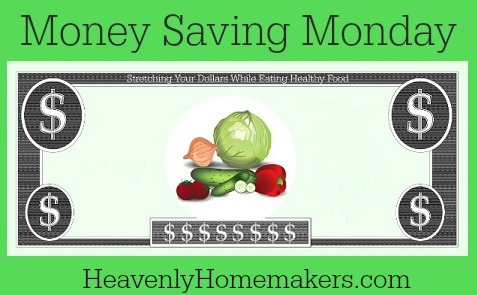 What are your favorite ways to save money on healthy foods? 2. What are the areas you struggle with most while trying to save money on healthy foods? I’m so looking forward to this series! Thanks for doing this! 1. I have found that lowering my family’s consumption of meat has saved us a lot. We are by no means vegetarian, and we eat meat most nights for dinner, but I stretch it in casseroles or sauces , so overall we need less of it. 2. The biggest obstacle for me in feeding my family well on a budget is that we are in a location with VERY limited resources. No trader joe’s, no local organic farms that offer reasonable prices, etc. I pretty much have to shop at Walmart and Sam’s. Also, I can’t buy organic, well-raised meat anywhere around here. It’s a bummer. Another reason we have cut our meat consumption! Mimi, I encourage you to look into Zaycon. I buy meat from them. They buy from the farmer, and pass it on to the consumer who ordered from them. They come around to different areas of the country at certain times. When you sign up you will get emails telling you what meat they are offering and when. I get meat that is better than I can buy in the store for the same price or less than what I pay in the store. Thanks for that info, Melissa! I’ll have to look into that! 1. My biggest money saving technique is to buy organic meat on clearance and stock up when it goes on sale….for instance, when Earth Fare marks down their grass-fed beef for 3.99/lb, I stock up!! I also love it when the stores (like Earth Fare) offer customer savings plans. You earn money everytime you shop and it will take it off of the total that you spend!! 2. My biggest struggle is allergies….my family has a lot of food allergies and shopping for a family with various allergies is very expensive. One child can drink milk, one cannot…one child can have gluten, one cannot. With the cost of food rising, it is very hard to feed a family of 4, with food allergies, on a very strict budget. I am determined to find a way!! Mimi, have you checked out eatwild.com? In the side column on the left, towards the top is a link “Shop for Local Grassfed Meat, Eggs & Dairy”. This will bring you to a page where you can choose your state and see all the farms in your area. This is how I found local farms in my area to purchase quality meats in bulk. It is an upfront investment to purchase 1/4 grassfed cow, 10-12 pastured chickens, and 1/2 pastured pig every year, but it is SO WORTH IT! The price is actually comparable to what the meat in the stores cost when you buy it in bulk like that. Of course, you have to have freezer space to store it all. It sounds like you’re doing a great job with the resources you have now, though. Good luck! A favorite money saver for me is shopping my local dollar store that carries fresh & frozen veggies and fruits. I couldn’t afford to serve these daily if I had to pay more. We’ve tried the mostly organic dairy,meat and veggies it just was’t realistic to shop so many stores and travel so far to spend so much money. Very hectic atctually. So for now, shopping around the corner for cheaper will have to suffice. I really do miss myAzure Stadrd orders though. We don’t have access to that anymore either. Waste not, want not. All veggies scraps go into making soup stock. The smallest bit of chicken goes into soup. Casserole. Hash. Stir-fry. We’ve been known to save 1/2 a rotten apple to make apple sauce. If you’re not sure, freeze it. We regularly have ‘leftover night’ and upside down meals where we have breakfast for dinner and stew for breakfast. Whatever gets it eaten. It kills me to throw something away that I worked hard to make and my husband worked hard to pay for! Our children are grown but I remember how hard it is to keep them fed! It is great to not worry about it anymore! When the kids were still home I did not put all of the food on the table if I needed it for another meal and they knew that if it was not on the table they could not have it. So, if you want to have some of the ham for later you have to keep it out of sight! Some of our five would eat just for the sake of eating if there was still more available. Occasionally I would ask if they were really still hungry because they did need to learn to not overeat and have self control in that area of their lives. I am not saying this is the case with your boys but I do see kids just eating and eating whether they are hungry or not. To save on groceries for just the two of us I do shop at Sam’s and Aldi and every few months a trip to Trader Joe’s. Now that we are in our 50’s we do just eat a lot less so we can afford a nice steak once or twice a month because we just eat 4 ounces of meat. So far I have cut done on what I make and that helping. We dont usually like or eat leftovers that was such a waste. we’ve found we actually love oatmeal with fresh or frozen fruit 2-3x wk (that keeps them full till lunch) or eggs (2-3 each) and 1 piece of bacon for flavor and homemade toast, fruit at breakfasts. something special like waffles, or baked puff pancake on weekends. (you would need to make 2-3 pans, our family of four eats the whole thing up!) We have chickens and are also buying 3-4 18ct nest fresh omega 3 eggs frm costco most weeks, but it’s a cheap protein. lunches are leftovers, salads, pasta, sandwiches (When we do the nitrate free deli meat, we try to just use one or two slices a sandwich with cheese and veggies. I portion it out into bags and freeze the rest), breakfast items. snacks are nuts, fruit, toast, boiled eggs, an occasional treat like cookies or your jam bars, or cheese with the fruit. dinners right now are not the cheapest but favorites are roast/smoked chicken and veggies or fish (mashed potatoes for kids), taco and beans nite, soup and salad nite (toast for kids), pizza and popcorn nite (it helps that only 2 like pepperoni, and hubby and I do lots of veggies), spaghetti or spaghetti squash, salad, biscuits/garlic toast; and a casserole or chicken pie nite , or occasional meatloaf or burgers (like 1x month), and if I made extra, leftovers; or grilled sandwiches, stuffed eggs, mac n cheese, broccoli one nite. I find buying produce that’s in season helps a lot. I find cooking dry beans for meals in my slow cooker is easy. I grow what I can in my garden but not as much as I’d like–partly because I work full time. One thing I struggle with is reducing waste. We do quite well, but it can be challenging. I wish I had a still-more efficient way to keep track of what I have (produce, leftovers, etc.) on hand. I’ve starting listing meals that I have in my spare freezer with dates, which has helped. I still could do better with this, though. I put a piece of self adhesive white board type paper on my freezer. Then I write down the date and what I put in there. It has helped me a lot. I have a 24 year old son and a 17 year old daughter at home and I think my daughter out-eats my son! So, basically, I am feeding four adults now. I find that reducing the quantity of meat that we eat at any given meal helps keep costs down. For example, when I use chicken breasts, we each get 1/2 of one for the meal. I also add lentils to the ground beef that I make for tacos and sloppy joes. The flavoring of the seasonings means that you don’t taste the beans and this really helps stretch the meat! To keep my family from eating something that I’ve reserved for another meal, I just mark the packaging or container, “NO! NO!” or “IF IT’S NOT SUNDAY, YOU CAN’T HAVE THIS!” or something like that! They know not to touch it or they might not eat another day! Aldi is carrying some organics now, so if there is one in the area and it may be worth checking it out again for those on a tight budgets like we are. I have gotten organic tomatoes, lettuce, and apples there, plus some organic (or with clean ingredients) pre-packaged items for snacks. They have some gluten-free snacks as well. Unfortunately I can’t cook from scratch much due to our living arrangements right now, so I am spending way more than I want to on food and have resorted to organic/non-GMO foods that are fast and easy to make and clean-up. So… I vaguely know my prices and grab things at the different stores where I shop when they are on sale. I just want to say, you are awesome for cooking so much healthy food to feed your growing family! Freezer cooking and meal planning have definitely been the best ways for me to save money. My weakness is buying premade foods that I could make myself for a lot less if I took the time to do it, so it really helps to have snacks and easy meals on hand for busy days :) Thanks for all your information and encouragement, I love reading your blog! Also, I always keep seasonal fruit on hand for the munchers in the family. It’s cheap & plentiful. We have had apples galore lately and are moving to pears soon. Frozen grapes are also great in lieu of ice cream/popcicles – bought on sale of course! Right now my biggest challenge is that we have ten growing children, and I am pregnant with number 11. We have four, soon to be five teens and they eat more than I do lol. I have been terribly sick so I haven’t been able to do as much as I usually do. You have been my favorite blog for a few months, thank you! I have teens too both with a serious sweet tooth? But making biscuits with some healthy things in them, I had the meat guy at my favorite organic llocal grocery store grind up a pork roast, 3.49 / lb added spices and made sausage added a sclice of healthy cheese froze the sandwiches and they eat them for breakfast. I’m going to try ham next time and I added an egg one time? Making the biscuits are key because of additives either theirs or yours??? I get a local farmers veggie box weekly and that helped because its organic and cheap, but I did get a lot of beets which we don’t like? Overall it was well worth it and saves money, I’m getting great green leafy now. Its apple season and I made apple sauce and froze sliced apples for pie in Jan. If you like sweet or dill pickles try pickling your beets. I don’t like regular beets, but pickled beets are great! i have a local farmer that I buy most of our meat from. It is all grass fed, pasture raised and since it is a direct buy it is much cheaper. I have a big garden and can a lot, and this time of year we have lots of soups. It makes the food stretch and is filling. Looking forward to lots of other ideas. There is also a bulk food store about an hour away in an Amish community that I shop at every couple of months. They have wheat and organic grains. Also found a produce auction this summer in that same community, found some real good buys. I’ve been cooking for teenage boys my entire cooking career (started cooking for my family full time when I was 12, I’m now 17) and it never fails to amuse me how I am perfectly capable of preparing a full turkey dinner for 17 people in six hours by myself, yet I cannot make a single serving of anything except oatmeal. That is wonderful about the shoes! We went to have dinner at a friend’s house a few weeks ago and they gave my son an almost brand new pair of tennis shoes that the husband couldn’t wear. Such a blessing! I have 2 teenagers and I am continually amazed at the amount of food they can pack away so I, too, am always looking for new strategies to save. Cooking from scratch and buying in bulk are my favorite ways to save, as well as eating simple meals. My biggest challenge is with fresh fruits and veggies. I am looking so forward to this series. Thank you, in advance. I know it’s going to be great! Thanks so much for this tip. I bought some butter/olive oil spread to use on toast, but it was not cheap and it still wasn’t very spreadable. Cannot wait to try out this trick. Will also save on the butter because it’s gotten so very expensive the past 2 months! I refuse to go back to our old ways with Country Crock, even though it’s so much cheaper than real butter now! I leave my butter (just the amount I will use in the next week) out on the counter. It does not spoil unless you leave it out for an extended amount of time, and is always soft and great to spread. I don’t have many tips for saving money, except using Amazon subscribe-and-save. But the thing I struggle with most is say, granola bars–the chemical, vegetable oil, and HFCS version versus the organic version–are on sale for $1 or something ridiculous like that. I live in a rural area so I don’t have full access except via the internet, so those huge sales really tempt me sometimes. Also my husband does not see the value of whole foods, so he brings some things into the house for himself that I wish he didn’t. For the writer who doesn’t like beets, make carrot and beet cake, looks like red velvet cake( so beautiful) if you have lots shred and freeze in 1 cup batches. And everyone gets veggies, and filled up. My teenaged hollow leg son, playing junior hockey, loves this cake and he has no idea about the beets . It’s his first choice for his birthday cake, or any occasion. I order some of my food from Azure Standard, some from Country Life Natural Foods and some from Aldi’s. In fact, tomorrow the truck from CL is coming here with over $1000 worth of food for a few of my friends and I. Buying bulk whole foods helps a lot. My daughter and her husband are dairy farmers and we get our milk, eggs, chickens and beef from them. My son and husband are hunters and we eat a lot of venison also. We usually buy a pig from a local farmer, but this year have found it difficult to find one at an affordable price so we may have to do without pork. I grind my own wheat to make our bread, etc. and generally try to make everything homemade. We usually don’t go out to eat (maybe once or twice a year to a local organic restaurant), and we don’t buy very many processed foods. Not perfect, but trying to do the best we can. My newest money saving thing is I learned to can beans. Putting dry beans and seasoning in jars with boiling water and into the pressure canner. It’s quick to get going and it saves me money and to top it off I know exactly what is in them. Realized tonight we used the last jar of chili beans so I need to make more of those tomorrow. We have always used meat as part of a meal and not really the main dish. Soup, chili, stir fry, and things like spaghetti help with that. Breakfast for dinner on night a week. Homemade pizza. Now that we found out my husband is allergic to both dairy and soy I am glad that I already cooked from scratch. It’s hard staying a budget when you can’t serve a lot of things any more. Finding healthy fresh fruits and veggies close to me seems to be an ongoing battle. Our farmers market is not a place to save money because they charge more than the stores do. I found someone that sells great organic stuff but they are 25 minutes away so it’s not some place I can get to often. So I stock up when I can and can or freeze the stuff for later. I buy marked down organics. Saves me tons. In season produce, making my own baked goods and sweets. Meal planning also saves. The best thing to do is to menu plan and be sure you account for using leftovers. 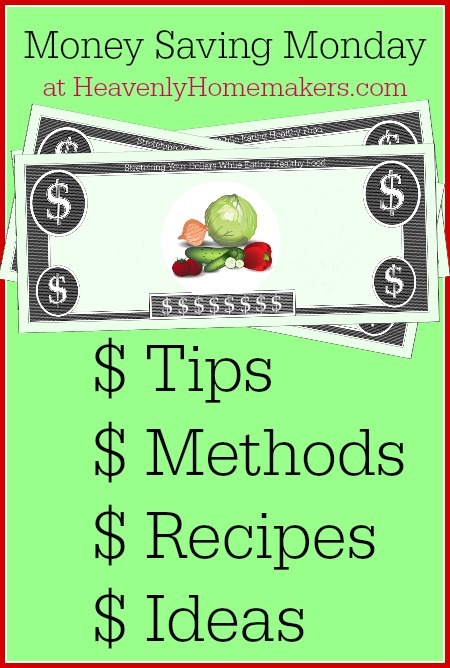 If you want to find some quick, easy and inexpensive recipes, visit our blog at http://modernmothercubbard.blogspot.com/ Three of us write the blog, two are mothers with young children, both of them working and also in graduate school. I am older, retired and with lots of experience in making the food dollars stretch (I raised six kids on a very limited budget). We are all about making healthy food choices when you don’t have much time or money. 1) i write our menu on a write erase board and hang it on my fridge, then you can mark after a meal what you have leftovers of so they aren’t wasted by being lost in the fridge and end up spoiled. 2) i remind my guys to slow down and eat. I serve one portion, they can have seconds of the sides (fruits/veggies), but then they have to wait for their bodies to digest a little before they have more-research says it takes 20 minutes for you brain to register satiation. 3) i live in a city so we have many store options but not a lot of “direct from the farm” options. I buy whats in season on sale, buy in bulk, and take advantage of the supermarket rewards programs. If you have a Meijers, there mperks program is awesome. Laura it sounds like my basement room looks a lot like yours. But since we are only two, it will last us about a year. We are also rural and have limited options locally. I pick up a few perishable things at the grocery store each week, but skirt the edges and avoid the pre-made items. The effort is always there to buy locally and make most things from scratch. We save a lot by purchasing some of our dry ingredients from our church food distribution system and other items from local farmers or the Mennonite stores. For packaged/canned items I still use; I take a monthly drive down the highway to Wal-Mart and Aldi. We mostly eat fresh produce, then some starchy foods, and the smallest portion of meat. When I purchase fresh produce I consider what I used to spend on meat and cap myself at $4 per pound. I have reduced our meat purchase by the same. We always get enough protein and meals are healthier. Our backyard garden provides a wonderful supply of fresh foods and the farmers markets and food stands provide much of the rest. I store up what I can of this bounty and that which others share. We recently canned about 50lbs of apples that came from one of my husbands co-workers. What a blessing since we do not currently have mature fruit trees! A budget is important to us as we live on a portion of our meager income trying to save enough for retirement. I don’t buy as much organic as I should because of the cost. However, I do always read ingredients and avoid many things that I used to believe were healthy to eat. I do the best I can with the budget I have but am always looking at ways to save more. I love your blog Laura and all the wonderful information you provide. I have always been budget minded when it comes to purchasing groceries. One thing I spin out on is trying to purchase bulk for future meals when I’m budgeted tight for my monthly spending. I absolutely find your articles informative, uplifting and a blast to read through, thank you for the effort you make in sharing your life this way to bless others! I find having a menu plan helps me, I also post it on the fridge so my children know what’s available to eat. I keep a supply of food on hand that they can eat when they are hungry, the variety depends on the season and budget, but I like to have available: fresh fruit, peanuts, cheese, and hard boiled eggs for my own.